We detect a cold, terrestrial planet in a binary-star system using gravitational microlensing. The planet has low mass (2 Earth masses) and lies projected at 0.8 astronomical units (AU) from its host star, similar to the Earth-Sun distance. However, the planet temperature is much lower, T<60 K, because the host star is only 0.10-0.15 solar masses and therefore more than 400 times less luminous than the Sun. The host is itself orbiting a slightly more massive companion with projected separation of 10-15 AU. 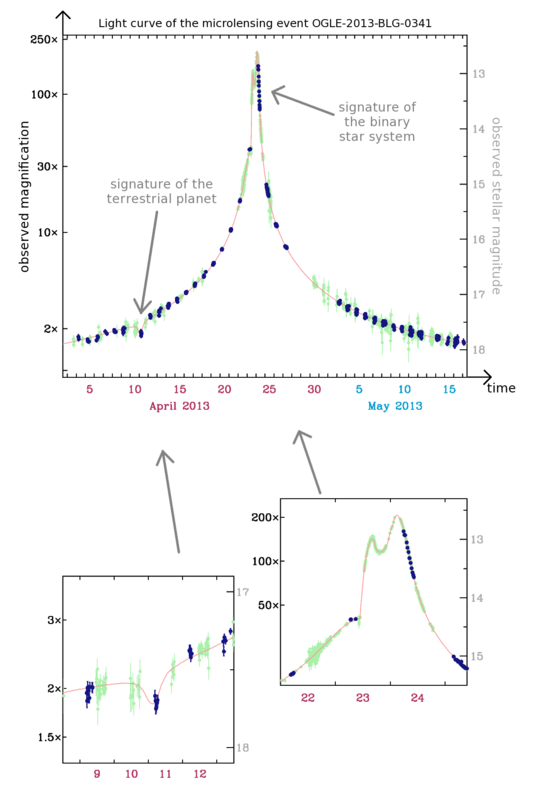 Light Curve of the Microlensing Event OGLE-2013-BLG-0341 (large blue dots indicate OGLE-IV observations). Close-ups show crucial parts of the light curve. Gould, Udalski, Shin et al., 2014, Science, 345 (6192), 46.